James McCollum batting for Waringstown on Saturday. Waringstown’s Premier League title hopes received a severe setback on Saturday after an unexpected defeat at Civil Service North. The villagers looked to be on course for a routine victory after dismissing the Stormont side for just 117. Phil Eaglestone, the left-armer seamer, claimed five for 26 as a late-order collapse from the home side stopped them in their tracks. Shane Getkate, the Northern Knights all-rounder, top scored with 22 but he should have been gone for just two but Waringstown failed to take a routine opportunity. The target still looked to be an easy one however, as James Hall and James McCollum put together a quickfire opening stand of 40 in eight overs. CSNI, who are in the middle of a terrible run of form themselves, had basically given up the ghost. However, after being dropped three times, Hall was bowled by Allen Coulter and when McCollum followed immediately, you started to sense something going badly wrong. Lee Nelson, could only fend a delivery to slip and then David Dawson was run-out after a mix-up with Adam Dennison. Dennison looked to be Waringstown’s best hope of getting to the target but he was lbw for 25 after hitting three fours and a six. 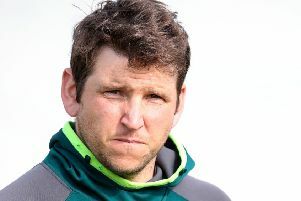 Every time Waringstown looked to be building something approaching a partnership they lost another wicket and the writing was on the wall when Ruhan Pretorius played on and was eighth man out. But even then Waringstown should have won. Getkate could not find his radar, bowling seven wides and had the villagers just blocked the ball they would have got there in extras. But instead two more batsmen flashed outside off stump and were caught behind. The shocking nature of this defeat was summed up a day later when CSNI were bowled out for just 49 by Lisburn and lost by 10 wickets. Without being disrespectful, they are the kind of team you need to be beating if you want to win league titles. Waringstown’s season reaches a crucial stage this weekend with a double-header in the Premier League and Sunday’s Irish Cup semi-final in Dublin. The villagers take on Lisburn in a rearranged 20-over match at The Lawn on Friday night. That game is followed by Ballymena’s visit to The Lawn on Saturday. Waringstown need to win both matches to have any hope of winning the Premier League title following Saturday’s massive setback against Civil Service North. However, the most important game is undoubtedly the visit to Pembroke on Sunday. The Dubliners have a crucial home advantage but are not regarded as one of the leading sides in Leinster. Waringstown welcome back left-arm spinner Gary Kidd who is expected to play after finger surgery. Match ball sponsor on Saturday is Betty Heyburn.